When living in a city for a long time, one has the opportunity to see the changes that businesses undergo and to reflect upon the reasons why. Quite a few close due to the retirement of their owners. However, in many other cases, their closure is due to the fact that there was quality missing in what they were offering, not to mention imagination in order to meet the requirements of the new social circumstances. This thought came to me as the 75th anniversary of the creation of revista española de pedagogía (the Spanish Journal of Pedagogy) was approaching, an anniversary which, in relation to marriage, is called a diamond wedding anniversary. I believe this is a description that can be applied to our journal’s track record. Indeed, there are very few pedagogical research journals throughout the world that have reached their 75th anniversary, still with the same name and producing punctual publications. Thus, this anniversary is the expression of a sparkling journey with both national and international recognition, one that has stood the test of time, such that we were the first journal in the Spanish language to be accepted in the most renowned database in the world, that of the Journal Citation Reports (JCR), and we are a publication boasting the highest ranking for research evaluation criteria, followed by Spanish public bodies. Countless people have worked with us to achieve these great results, whether on the journal’s Boards, by reviewing the articles, writing them or working in the dark and effective back office, which enables us to bring out a beautifully-produced issue. My most heartfelt recognition goes to these people. 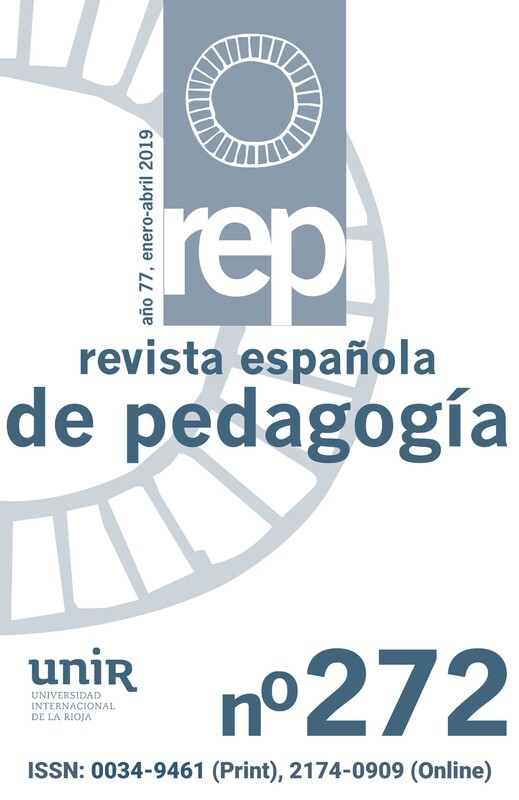 Over the years, the revista española de pedagogía has very positively contributed to improving the quality of educational research, which has been the criteria for selecting articles, as we have defended the idea that it is misguided to believe that, in education, there is only one best system, forgetting the plurality of human beings, and that it is even more misguided to promote a political ideology from a scientific journal. These principles have lead to the fact that, alongside internationally renowned researchers, our authors include practically all of those who have been at the forefront of pedagogical research in Spain over recent decades, many of whom began to publish their work here at a time when they still did not have an established academic position, but whose talent was discovered by the reviewers, who do not know the name of the authors whose articles they review. In addition to nurturing quality, we have sought to encourage imagination. We were the first to publish articles in other cultured languages, produce monographic issues, adapt to international standards regarding the presentation of articles, sell journal issues and articles online, etc. We have recently embarked on the adventure of publishing an online version of the articles and reviews in English, in addition to the printed issue in Spanish, which is a policy that we consider necessary given that 95% of journals included in the JCR are written in English. In order to commemorate this 75th Anniversary, there will be two Round Tables held in Madrid on 19th April, in which journal editors will take part —all of which are included in the JCR— Spanish, American, English, Mexican, etc. Details of this event will be provided in the News section of our website and also on the journal’s social media profiles, and we would like to extend an invitation to our readers now.